The owners of this Child's Play Centre wanted an amusing themed mural to compliment the play area they were creating. With this brief Garry then researched popular cartoon characters, and in consultation with his clients, came up with unique characters that would come to life in his wall mural. When the painting of the wall mural commenced, the area was divided into a race track & two party rooms. A fishy patrol warns of stop signs ahead whilst the cheeky fish make fun of the cat in the Fish Bowl room. 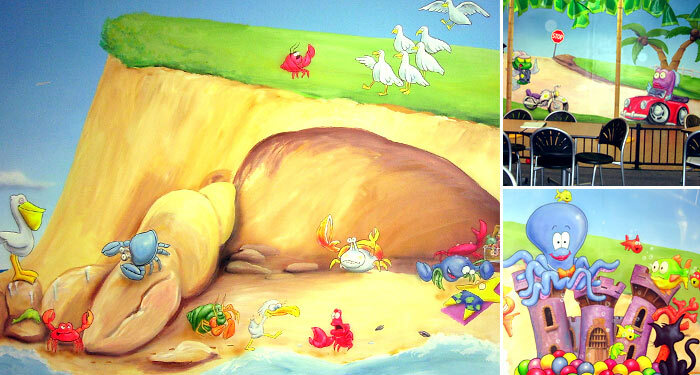 The Crab Cave next door has loads more adventures in this custom designed mural. The overall job took approximately 3-4 weeks from design consultation to completion. If you would like to get a free quotation on any ideas that you may have, please contact us. If you would like something on a smaller budget, and have the ability to move it around, Garry also specialises in creating artwork on canvas.